More than 350 vessels worldwide rely on our best practice suite for technical management. 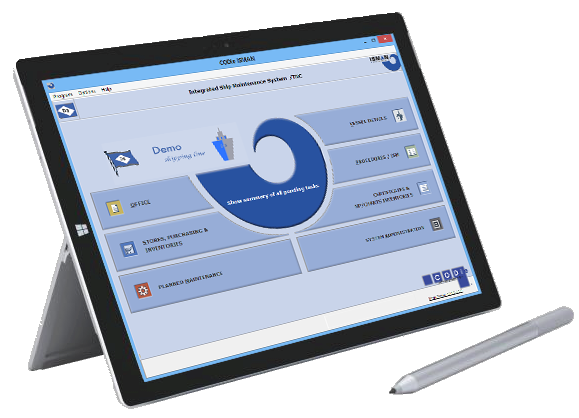 The CODieBOARD# isman-center is the central software system for planned maintenance management and maintenance monitoring. Further features include ISM management and ISPS management for the ship’s safety and security system and requisitioning and procurement for your fleet. By working closely with the classification societies, like GL, DNV, LR and others, we have developed standardized and approved data templates that allow easy system approval, e.g. for continuous survey (CS) and extended dry dock (EDD) certification. CODie ISMAN's planned maintenance software uses a part tree to keep track of all your equipment and warns you automatically about due maintenance jobs. It features a planned maintenance system with combined spare parts and consumables management and consumption monitoring. ISMAN's module for safety management handles all documents of e.g. ISM, ISPS, TMSA, ISO9000/14000, and fleet circulars. It takes care of the document flow between shore office and ships. Our maritime software offers you an easy way to handle all safety requirements according to class requirements and flag states. The ShipShop module is used for ordering and purchasing. The software enables you to automatically handle and monitor your orders, starting with the creation of the order on board to monitoring the invoice and the delivery of goods.